On 25 March 2015, an international coalition led by Saudi Arabia launched air strikes against the Huthi armed group in Yemen sparking a full-blown armed conflict. As well as relentless bombardment by coalition forces from the air, there is a battle being fought on the ground between rival factions. On one side are the Huthis, an armed group whose members belong to a branch of Shi’a Islam known as Zayidism. The Huthis are allied with supporters of Yemen’s former President Ali Abdullah Saleh. On the other side are anti-Huthi forces that are allied with the current President Abd Rabbu Mansour Hadi and the Saudi Arabian-led coalition. Civilians are trapped in the middle – more than 12,000 of them have been killed and injured, and a humanitarian crisis has spiralled. For two years, much of the world has ignored this raging conflict and heard little about its devastating consequences. Amal Sabri, a resident of Mokha, describing an airstrike which killed at least 63 civilians. It was like something out of judgement day. Corpses and heads scattered, engulfed by fire and ashes. The conflict continues to rage throughout the year. UN-sponsored peace talks begin in Kuwait in April but breakdown in early August. On 8 October, a Saudi Arabia-led coalition killed more than 100 people attending a funeral gathering in Sana’a and injured more than 500 others – one of the largest death tolls in any single incident since the start of the coalition’s bombing campaign. Approximately 18.8 million Yemenis today rely on humanitarian assistance in order to survive. In order to deny supplies to the Huthi forces, the coalition imposed a partial aerial and naval blockade. This is severely limiting the import and provision of fuel and other essentials, obstructing access to food, water, humanitarian assistance and medical supplies and causing food prices to soar, creating a desperate situation for millions of people. Damage to key logistical infrastructure, including bridges, airports and seaports, from air strikes has also severely hampered the movement of crucial humanitarian supplies. The Huthi armed group and allied forces are also endangering the lives of thousands of civilians in the southern city of Ta’iz by limiting the entry of crucial medical supplies and food. Humanitarian workers also accuse the Huthis of excessively restricting their movement of goods and staff, and forcing some of their aid programmes to close. people in need of humanitarian assistance including food, water, shelter, fuel and sanitation. On the other side is the military coalition led by Saudi Arabia and supported by President Hadi, which has carried out air strikes and ground operations in Yemen. Members of the coalition include the United Arab Emirates, Bahrain, Kuwait, Qatar, Jordan and Sudan. The USA and UK have been providing key intelligence and logistical support to the coalition. The force of the explosion sent my sisters and mother flying five metres, killing them instantly. Hani’s body was not dug out until 12 hours later. My father Faisal (60) was the only survivor. Leila Hayal who lost her mother and four siblings when a coalition airstrike destroyed their home in Ta’iz in the middle of the night on 16 June 2015. The coalition is allied with anti-Huthi armed groups operating on the ground in Yemen, often referred to as “Popular Resistance Committees”. They are also supported by units of armed forces loyal to President Hadi and a variety of different factions. Amnesty International has gathered evidence revealing that all the parties to this conflict have committed serious violations of human rights and international humanitarian law, including war crimes. 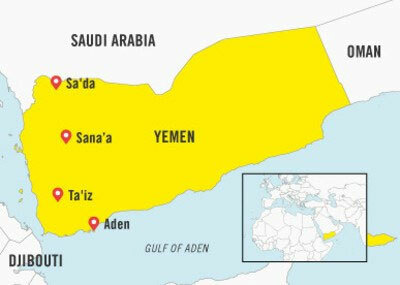 Amnesty International has documented 34 air strikes across six different governorates (Sana’a, Sa’da, Hajjah, Hodeidah, Ta’iz and Lahj) by the Saudi Arabia-led coalition that appear to have violated international humanitarian law – the rules that apply during a conflict which are sometimes known as the “laws of war” – resulting in 494 civilian deaths (including at least 148 children) and 359 civilian injuries. These have included attacks that appear to have deliberately targeted civilians and civilian objects such as hospitals, schools, markets and mosques, which may amount to war crimes. The Saudi Arabia-led coalition has also used cluster munitions, lethal explosive weapons banned under international law. When launched cluster bombs release dozens – sometimes hundreds – of small “bomblets”, which often lie unexploded and can cause horrific injuries long after the initial attack. Amnesty International has documented the coalition’s use of at least four different types of cluster munitions, including US, UK and Brazilian-manufactured models. Imprecise weapons are used on a daily basis in residential areas, causing civilian casualties. Such indiscriminate attacks violate the laws of war. I was standing in the kitchen when I heard an explosion. Suddenly all I felt was something in my neck… I am now quadriplegic, paralysed from the neck down. That night, shrapnel entered my neck and exited through my seventh vertebrae. We had just moved to our new house, we thought we were safe. Who will take care of my family now? Amnesty International has also investigated 30 ground attacks – by both pro and anti-Huthi forces – in Aden and Ta’iz which did not distinguish between combatants and civilians, and killed at least 68 civilians, most of whom were women and children. Fighters from both sides have also used imprecise weapons, such as artillery and mortar fire or Grad rockets, in heavily populated civilian areas and have operated in the midst of residential neighbourhoods, launching attacks from or near homes, schools and hospitals. All these attacks are serious violations of international humanitarian law and may amount to war crimes. The Huthi armed group, supported by state security forces, has carried out a wave of arrests of its opponents, including human rights defenders, journalists, and academics arbitrarily seizing critics at gunpoint and subjecting some to enforced disappearance as part of a chilling campaign to quash dissent in areas of Yemen under its control. Anti-Huthi forces allied to Yemen’s President Hadi and the coalition, have also carried out a campaign of intimidation and harassment against hospital staff in Ta’iz and are endangering civilians by stationing fighters and military positions near medical facilities. “The irresponsible and unlawful flow of arms to the warring parties in Yemen has directly contributed to civilian suffering on a mass scale. It’s time for world leaders to stop putting their economic interests first” James Lynch, Amnesty International. In the face of multiple reports pointing to reckless conduct in Yemen and the devastating impact of serious violations of international law on civilians, many countries have continued to sell and transfer weapons to Saudi Arabia and its coalition members for use in the conflict,. Arms have also been diverted into the hands of Huthi and other armed groups fighting in Yemen. Several of these states are parties to the Arms Trade Treaty which has the aim of “reducing human suffering” and which makes it unlawful to transfer weapons where there is a high risk they could be used to commit serious violations of international law. In such a context of lawlessness and abuse, there is an urgent need for truth, accountability and justice for victims of the conflict. Given the apparent inadequacies of Saudi Arabia and Yemen-led investigations to date, Amnesty International believes the only way to achieve this is through the establishment of a UN-led independent international investigation to look into alleged violations by all parties to the conflict with a view to ensuring that those responsible for crimes are brought to justice in fair trials and effective measures are taken to address the suffering of victims and their families and to help them rebuild their lives. Act now to stop the sale of weapons that fuel violations and destroy civilian lives in Yemen.